Tenochtitlán was officially founded in 1325 but it would be over a century before the city rose to its height as an imperial capital. Between 1372 and 1428 the Mexica emperors called huey tlatoque or "great speakers," Acamapichtli, Huitzilihuitl, and Chimalpopoca served as the vassals of a despotic Tepanec lord named Tezozomoc of Azcapotzalco. Sharing in the spoils of victory they succeeded in expanding their own domain south and east along the lake. However, when Tezozomoc died in 1427, his son Maxtla seized power and had Chimalpopoca assassinated. The Mexica quickly appointed Chimalpopoca's uncle, a war captain named Itzcoatl, as huey tlatoani. Itzcoatl allied himself with the deposed heir to the throne of Texcoco, the Acolhua kingdom lying on the eastern shore of the lake, Lord Nezhualcoyotl. Together the two kings attacked Azcapotzalco. The seige lasted for over a hundred days and only concluded when Maxtla relinquished his throne and retreated into exile. Itzcoatl and Nezhualcoyotl then rewarded the Tepanec lords who had aided them in overthrowing the tyrant. 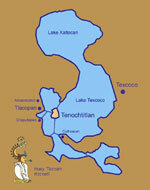 The three cities of Tenochtitlán, Texcoco, and Tlacopan formulated the new Aztec Empire of the Triple Alliance. Click on Image for more detail. Codex Ixtlilxochitl illustrates Lord Nezhualcoyotl of Texcoco in his battle dress. Click on Image for more detail. Itzcoatl died in 1440 and was succeeded by his nephew Motecuhzoma Ilhuicamina. Motecuhzoma I, as he was later known, charted the course for Aztec expansionism for the remainder of the 15th century and was succeeded by his son Axayacatl in 1468. The successor had proven himself a capable military commander as a prince, now he sought to capitalize on the conquests of his illustrious father by entirely surrounding the kingdom of Tlaxcala to the east and expanding imperial control over the Mixtecs and Zapotecs of Oaxaca to the south. By 1481, Axayacatl had died. He was succeeded by Tizoc, who ruled briefly but ineffectually. In 1486, the throne passed to Tizoc's younger brother, Ahuitzotl, who proved himself to be an outstanding military commander. Ahuitzotl reorganized the army and soon regained much of the territory lost under the previous administration. He then initiated a program of long distance campaigning on an unprecedented scale. The empire reached its apogee under Ahuitzotl dominating possibly as many as twenty-five million people throughout the Mexican highlands. Ahuitzotl in turn was succeeded by the doomed Motecuhzoma II who suffered the Spanish invasion commanded by Hernan Cortés. Click on Image for more detail.